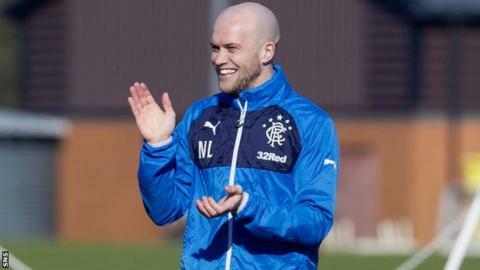 Rangers manager Stuart McCall has laughed off reports suggesting clubs are queuing up to sign midfielder Nicky Law. The 27-year-old has helped Rangers win consecutive titles since joining from McCall's Motherwell in May 2013. "Lawsy's probably got something that I never had as a player and that's a very good agent," said McCall. "All you need is an agent to know one person at a newspaper to put a story on the back page." Law has scored 12 goals this season and is likely to be in McCall's plans for the Scottish Premiership next season should Rangers win promotion via the play-offs. "There's probably no bigger fan of Lawsy than myself, but also I'm probably his biggest critic," said McCall. "Because even though he comes off the park on Saturday with two goals and a smile on his face, I still think he can do more - and I think he's got to do more consistently. "But I know the type of player he is and he's capable; left foot, right foot, technically very good. "If he's playing at the top of his game, he can play at the highest level - certainly the highest level in Scotland, which he's proved with Motherwell." However, McCall dismissed reports linking Law with a move away from Ibrox. "He's not only a good player - he's got a good agent," he said. "One newspaper has run with it - 10 clubs, half a million pounds. I think you take that with a pinch of salt." McCall: "Lawsy's probably got something I never had as a player - a very good agent."